Need Help? We'd Love To Hear From You! Do you have, or will you be receiving a high school diploma or G.E.D soon? If yes, then you are already on your way to meeting the admissions requirements at Nuvani Institute. Life after high school can seem daunting, but with a solid plan, the experience won’t be so intimidating. Consider attending a career school where you will gain skills that will make you successful in the beauty industry. We can help you decide on a specialty that best fits your career goals! Whether it be cosmetology operator, Cosmetology Manicure Specialist, or Cosmetology Esthetician we can find the perfect program for you. Our programs vary in length and times they are offered, as well as hours required for completion. We encourage you to research potential careers and get in contact with our admissions staff to learn more. If you have a passion for beauty but aren’t sure if you can fit in with the current mold – perfect, this is the career for you! Franchisehelp.com says, our definition of beauty is malleable and ever changing – providing never ending opportunities for the industry to innovate. If you watch a makeup tutorials on YouTube or see a look on Instagram and know that you could re-create it or even better, elevate the look, then it’s time to get involved! This is a growing industry that has no decline in sight. 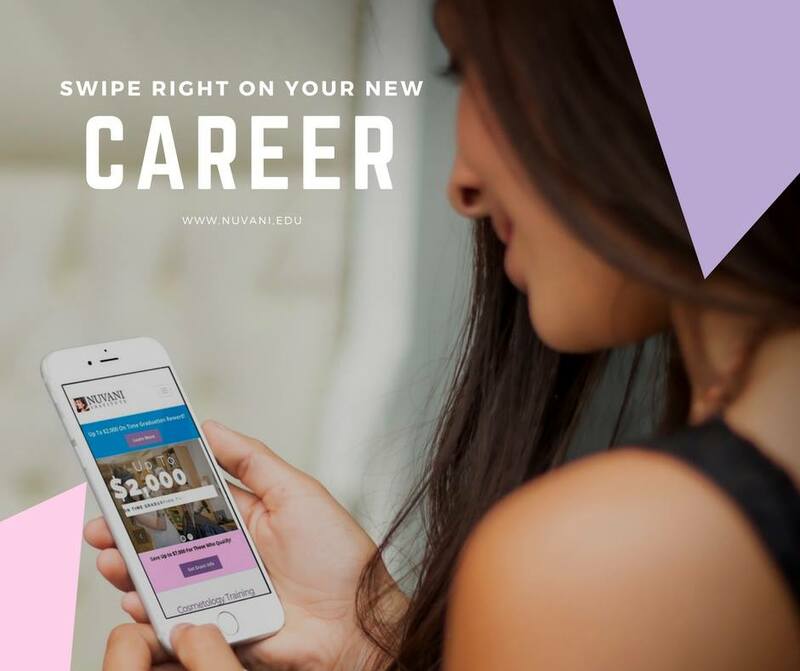 At Nuvani Institute, you will gain theoretical as well as practical knowledge to prepare you for your future in the beauty industry. Our curriculum has been carefully crafted to prepare you for the required Cosmetology Practical Operator Exam to receive your State of Texas Student Cosmetology License. Once completing your desired program, successfully passing your exam, and receiving your license you will be set up for success. Though working in a salon is the first job that comes to mind when you think of a cosmetologist, there are many options that are available to beauticians with thorough knowledge and skill. Start your career as a beautician in the field of makeup and beauty care by an accredited beauty school.